This week marks the start of a new school year for most Metro Atlanta schools. 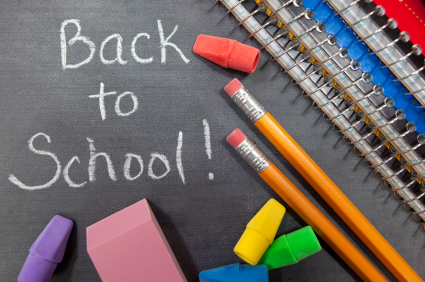 We recommend using the opportunity to commit to a more organized and efficient year in terms of your children’s homework, gear, responsibilities, and activities. In order to help you set your child up for success, we’ve put together a few basic strategies. Implement these at the start of the year and within a few weeks the new system will seem standard within the family. Homework: For some families, this daily task can be a real challenge. Minimize struggles, by creating a routine. The homework routine shoul d, as much as possible, be consistent week-to-week and day-to-day. We recommend setting a specific time of day and allotment of time for the task to be completed. Although this may need to be flexible for older children, having a general idea of when they are to work on homework and for how long will help keep them focused during the task. The homework process should also be conducted in a space free from distractions, such as TV, phones, and even siblings. Once the child’s homework is done it should immediately be put back in the school bag or otherwise be prepared for return to school the following day. School Gear: Backpacks and school binders can quickly become messy and disorganized. Products designed to organize these items can help keep things under control, but the more important part is that your child actually utilize the system. Prior to the start of school, discuss with your child the importance of organization and how to keep their belongings neat. Then set up a routine where they clear their backpack or binder of unnecessary items and nicely rearrange the leftovers each night. This re-set technique works great for adult offices and can be just as effective with kids. A final recommendation for maintaining paper organization is to implement a permission slip inbox/outbox. Simply set up a tray, folder, or other type of document catcher in the house and encourage your children to deposit unsigned slips in the folder each night and pickup the signed slip in the morning before leaving for school. Activities: American children often have many activities and obligations each week. If this is true of your family, there are a couple of strategies you can use to prevent overload and missed engagements. First, decide how many commitments you and your child can reasonably agree to each week and standby this number when additional opportunities arise. It can sometimes be difficult to say no, but learning the skill can help you and your child retain personal time that is extremely important to mental health. Second, keep a family calendar, either paper or digital, that documents all activities. Each Sunday the family should review the calendar and discuss each person’s responsibilities including things like pickups and snack duties, etc. With continued use of these strategies, school routines and tasks can become more streamline and worry-free. Some of the best professional organizer tips are the most simple. They’re the kind of small changes that make such a noticeable difference that an entire home can feel drastically more organized once implemented. Below are some of o ur favorites. 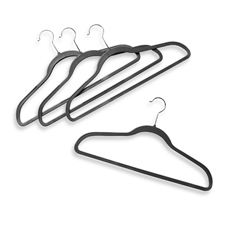 Hangers: One inexpensive change is to swap out old mismatched hangers for a new set. The change will not only increase the perception of organization, but if you select a thin, slip-free variety it will also help maximize space in the closet. Like with Like: Instead of storing items anywhere they’ll fit, take the time to group like items together. For example, in your linen closet, designate specific shelves to certain items such as pillows or sheets. This will greatly improve your ability to easily find what you need. Labels: Organizers love labels because they work. Labels encourage a behavior of putting items back in their designated homes. 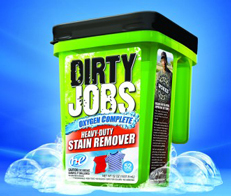 There is no confusion about where things belong and thus organization is more easily maintained. The Daily Reset: We often talk about the re-set in terms of an office, but the concept applies to all aspects of one’s life. At the end of the day, take a few moments to put things back, prepare your physical needs for the following day, and generally tidy up. The daily routine will drastically cut down on lost belongings and general disorder. Counters: Clearing kitchen and bathroom counters of all unnecessary items can drastically reduce visual clutter. For example, if you use the toaster once per month, consider moving it inside a cupboard. The extra counter space will make the room feel cleaner and larger. The Well-Organized Woman is a big fan of donating household excess to charity, but if you’re looking to make a bit of money off of the items you’ve culled, garage sales are excellent options. Although the process may seem straightforward, we’ve pulled together several strategies that can help ensure a successful sale. Research & Plan: Many cities regulate the number, type, and location of signs that you may post around town to advertise your sale. They may also require a permit be pre-purchased in order to host, so make sure to investigate the rules and regulations in advance of your planned date. While scheduling the sale, there are several things to keep in mind. First, do a bit on online research and see if there are any other neighborhood sales already scheduled that you can join in on. These tend to draw larger crowds and increase your opportunity for sales. Second, take into consideration that holidays, days in which there are large local events scheduled, and vacation season may not be the most ideal times to host your event. Advertise: The most important thing you can do to drive traffic to your sale is to advertise. For physical signs, choose brightly colored paper and use arrows to indicate directions to your location. Include cross streets on signs that are posted farther out and utilize sales slogans such as, ‘everything must go’ to excite passersby. 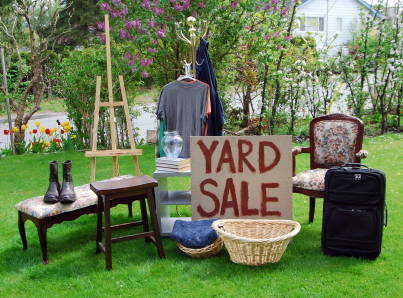 Additionally, you can make use of online resources, such as craigslist.com, garagesalestracker.com, yardsalesearch.com, garagesale.com, and various social media sites. For smaller communities, newspapers and bulletin boards can also be helpful tools. Generally, advertisements should be posted 1-2 weeks before the sale. Organize: Prior to the big day, plan to spend some time preparing your goods. Every item should be clean (to a reasonable extent), priced, and bundled with coordinating accessories. 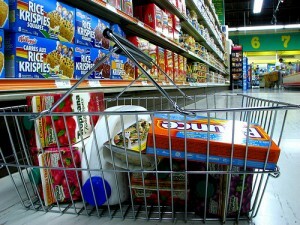 It is also helpful to group like-items together, to make shopping easier for your patrons. For example, kitchen items can be placed on one table, while clothes are on another. When pricing items, be thoughtful about the expected deals shoppers intend to find. Unless the item is brand new, the price should be deeply discounted. Hosts should also prepare for the sale by procuring change, including more one and five dollar bills than you think you will need. It is also smart to have a plan for the cash exchange process. Will one person handle all sales or will several? Will the change be stored in a box, a wallet, or somewhere else? Having answers to these questions ahead of time will save confusion and hassle during the sale. Display: Just as stores merchandise their products in a fashion that is both pleasing to the eye and easily shoppable, so too should you. While setting up your sale, take time to display your goods in a way that is organized, but also interesting. For example, if you have china or decorative pieces, consider setting them up as a set table thus illustrating to your customers the way the set could look in their home. With a bit of planning and a lot of organization you are sure to have a profitable sale. As the popularity of home-based jobs and telecommuting increases, many people find themselves struggling to maintain time management. The flexibility of working from home can have potential difficulties, but with a few basic strategies the arrangement can produce much success. Establish a Schedule: Setting up time parameters for when you will work and when you be off will help you maintain the necessary mindset for professional activity. If you are able to set your own schedule, attempt to keep the same hours each workday to ensure optimum productivity. Whether you are a morning person or a night owl does not matter; what is important is that you commit to starting and stopping at the same time each day. Minimize Distractions: Working from home can produce distractions that may otherwise be avoided in an office. Maintaining a space that is dedicated to work can help minimize the possibility of wasted time. If you have an office, excellent, but if not choose a location that is separate from obvious distractions such as t.v., household chores, or kids, etc. Your work area should also be well-stocked with all necessary supplies and electronics. 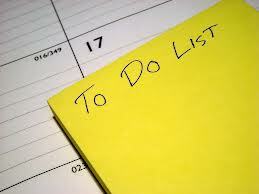 To Do List: At the beginning of each day, create or update your to do list with the tasks required of you. Tasks can be grouped together in blocks, including phone calls, emails, physical tasks, and needs from others. Grouping items can increase efficiency by having similar tasks completed while you are already in that mindset. Breaks & Socializing: Working from home can at times be isolating. Scheduling plans for regular social interaction, be it happy hour or a quick lunch break with a friend, can help keep you from becoming too disconnected from the world. It will also ensure other forms of connection, such as social media or personal phone calls, are kept to a minimum during the week. Timed Activities: Use a timer to ensure you focus on necessary tasks for specific amounts of time. For example, if you have a writing project to complete, set the timer for one hour and commit to dedicating your attention to that sole task. During the pre-set time, ignore emails, set your phone on silent, and let family members know you are off limits. Everyone has personal tasks that come up during the week. In order to manage the draw to execute these immediately while at home, set aside a specific time each day to make your personal calls, get to an appointment, or handle other needs. If it is not your scheduled personal time, resist the urge to get off track. By utilizing these strategies you will help to ensure your work-from-home arrangement is mutually beneficial for you and your employer. One of the major organizational challenges my clients face during the week is finding and/or taking the time to prepare a meal at home. And when I do, it’s as if I (re)discover for the first time how wonderful it tastes and feels to eat homemade cooking – not to mention the cost savings per person on just one meal! Though cooking at home comes with so many positives, there is one negative that comes to mind that. I’m talking about the clutter of all of those recipes you collect. These days, there are so many places where you can find a way to make a meal for yourself and your family, be it through cookbooks, a trusted friend or a recipe website. And with each of these comes a piece of paper with ingredients, directions and notes for next time you make it. While it’s wonderful to build a collection of meals and experiences, it’s often hard to keep them all in one place – I know I’ve found myself searching for a needed recipe the moment before I’m heading to the grocery store, and if I can’t find it online again, it’s lost! The simplest way to keep track of paper recipes is to contain this potential clutter in one folder in one place in your home. Though it may seem counterintuitive to keep your recipes in your paper office files, you’ll be more likely to locate them given that ‘like is with like’. Try to alphabetize by name of dish so you won’t have to flip through the stack for too long! If you want to take it one step further – you can also add additional folders to a hanging file separated by type of meat or type of dish. But again, only if you have the energy and organizational style to do so. If you are a little more technologically savvy, most recipe websites, like allrecipes.com, have digital recipe boxes where you can store your favorite recipes with notes. Taking the time after you’ve prepared the dish to store the recipe online will give you the freedom to recycle the paper and cut down on physical clutter completely. 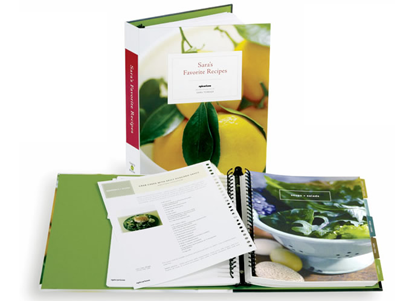 Tastebook.com is a fabulous idea for compiling all of your random paper receipes into a digital and nicely bound book with photos. 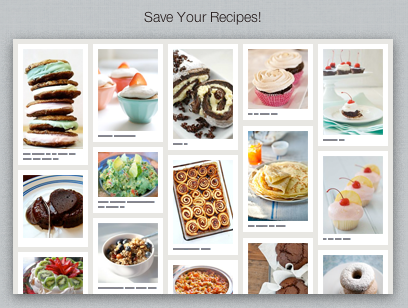 I also love the idea of using Pinterest to find and organize recipes. If you find a great recipe on another site, simply pin the photo to a board and you’ll have a photographic collection that is easy to access anywhere. Feel free to label boards by type of dish for additional organization. 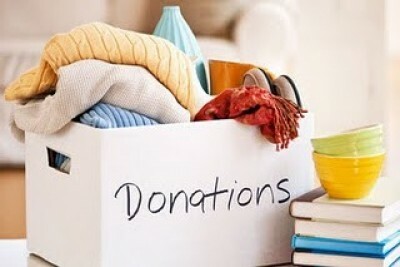 As you can see, just a few simple changes can help you take that one step towards a little less clutter in your house. Bravo to you for taking the time and care to cook at home. I’m sure your wallet and body thanks you.